In the 1989 film When Harry met Sally , the romance between Harry and Sally caused sparks (you may remember that diner scene). For regular readers, this may not come as a big surprise – we have been telling you about 88E’s Alaskan play since it first moved there, back in December 2014 . Since the intra-week high, the 88E share price has come off a bit, which can be expected in this volatile speculative end of the market, which was somewhat driven by rumours of a capital raising. Like all junior oil explorers, going to the market is sometimes necessary, but 88E’s balance sheet appears to be in good order, for at least another few months. Now, before we go too far, we should remind readers that this is a speculative stock – success is no guarantee in oil exploration, and its recommended caution is exercised if looking to invest. Since completing the Icewine #1 well a few months back, all-important well data has flowed freely from the core analysis, but things came to a head this week. We all found out that 88E’s Project Icewine is right in what’s called the ‘Thermal Maturity Sweetspot’ – this is where the volatile oil window meets the gas condensate window, or, that perfect spot where oil meets gas . All other things being equal, this means that hydrocarbons should flow at a material and commercial rate here, given the excellent porosity and permeability of the HRZ rocks, also recently reported by the company. It’s becoming clearer that the project team’s pre drill predictions on what might be down there are turning out to be accurate. That’s an excellent result for 88E, who is steadily de-risking its project with a view to attract a bigger project partner. Whilst it appears that pretty much every box has been ticked to date, no play is proven until the black stuff is flowing to the surface. Not long after that, we would expect the Independent Resource estimate to be revised from the original done back in January 2015; this would be on the back of the positive drill results, and also the expanded acreage 88E now control. i.e. its more than likely going to be a lot bigger . 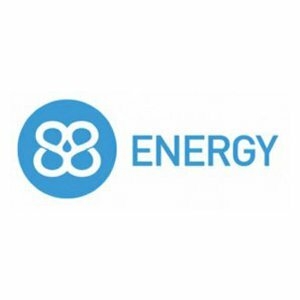 Those of you who are regular Next Oil Rush readers will know we’ve had a watch on 88 Energy (AIM:88E; ASX:88E) for quite a while now, and we still continue to follow the company closely. We’ve followed the company through important capital raisings, land acquisitions and early technical work – all in anticipation of the drilling of the landmark Icewine-1 well, into the potentially mammoth HRZ shale play in Alaska. The company has released a slew of technical data from the drilling, which has confirmed most, if not all of 88E’s bullish pre-drill predictions, and gone a long way to de-risking the project in the eyes of potential farm in partners. 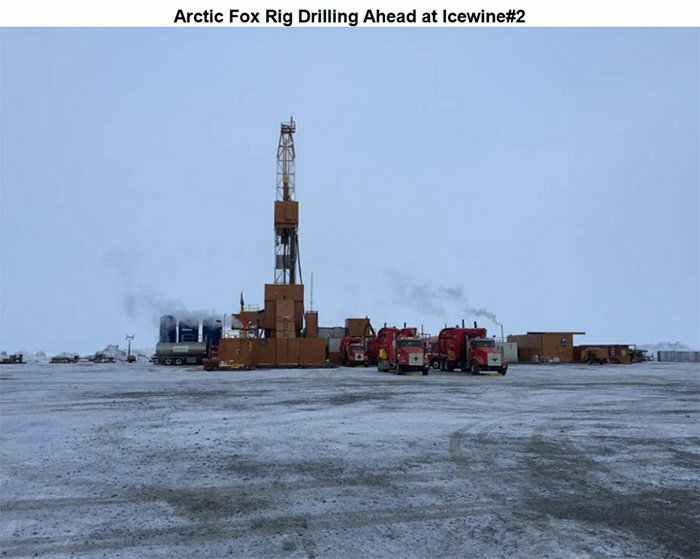 Now that the majority of the results from Icewine#1 have been released, the focus will shift to updating the resource, seismic acquisition and planning a second well. determine how best to extract it. Let’s get up to speed with the highlights since our last update article 88E Doubles Leverage to Potential Mammoth Oil Find , back in December 2015. Analysis of drill cores suggests a large portion of the HRZ shale on Project Icewine is within the thermal maturity sweetspot needed to make 88E’s play a success. It was also found that permeability and porosity characteristics were also above what was needed for the shale to be considered a success. Remember ‘porosity’ is the holes in the rock where the oil sits – the more holes, the more oil. And ‘permeability’ is the cracks – better permeability means better flow rates. Previously, 88E hit oil shows and elevated gas shows while drilling through the Brookian conventional horizons above the target HRZ shale. In particular, a 110-foot section hit gas shows “significantly above background”, while oil shows with minor fluorescence were also recorded. 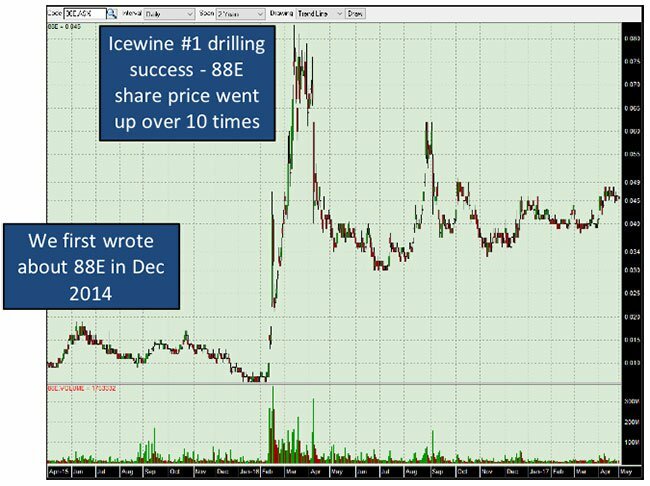 88E hit more oil shows at Icewine-1, while ‘visible bleeding out gas’ was observed within the target HRZ Shale. In late January, 88E announced that it had confirmed the presence of liquid hydrocarbons while leaching the cores and that mass spectrometry analysis of mud gas confirmed liquids rich gas throughout the HRZ shale interval. Initial results supported HRZ thermal maturity as per pre-drill modelling at Icewine-1, with further testing indicating it was spot on for what you need to be in the sweetspot. All of the above are positive signs, and contribute to 88E’s recent success. Let’s zoom out a little and find out the context of the Icewine #1 results to date, and where it may lead 88E next. In a nutshell, 88E is targeting what’s known as the HRZ shale in onshore Alaska though its Icewine project. The reason why investors have been drawn to the 88E story is because of the striking potential of the HRZ shale layer at Icewine, predicted to be the source of oil. This immediate region itself has been lightly explored in the past, with private company Great Bear Petroleum to the north of 88E doing most of the lifting, until now. Great Bear Petroleum drilled two wells just north of Icewine back in 2012 targeting the HRZ shale. But, given it’s a private company, publicly available results are hard to come by. But what we do know so far is that the two wells drilled by Great Bear showed that the HRZ Shale had total organic content of up to 8% within the shale, and that the rocks were brittle in nature. That means the rocks are frackable, which is a good start. The numbers also revealed that porosity peaked at a massive 18.4%, an exceptional figure which is an indication of how much oil these source rocks can store and what the ultimate recoverable resource could be. Better yet, there were oil shows through 180m of the shale. The average porosity is 50% better than that of the sweetest of sweet spots of the prolific Eagle Ford shale in Texas. 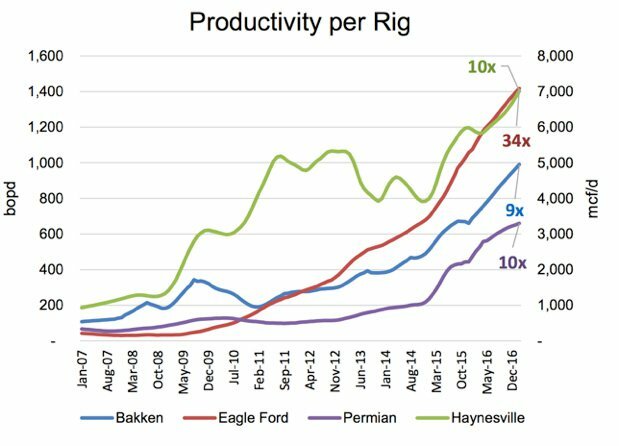 A slew of technical data has it comparing rather favourably with plays such as Eagle Ford and the Barnett shale as well. These are simply as good as it gets for oil-bearing shale, so for the numbers on the HRZ to be lining up to such an extent at the very least required testing with the drillbit... And 88E did just that through the end of last year. The thing with drilling of this nature is that there is comparatively little data available immediately after target depth is hit – most of the juicy stuff comes out after lab analysis of cores and cuttings – which is exactly what has been going on over the last few weeks, and the market has started to respond. Add in that 88E is expected to conduct seismic in the near-term, and news flow on just what it was able to uncover should flow steadily over the next few months. But in any case, let’s find out a bit more on what we know so far. With oil and gas drilling, the good companies give you regular updates – no matter how minor the updates may be. 88E continues to keep shareholders well and truly updated on what is going on at Project Icewine, a sign that it takes its disclosure requirements seriously. However, with the plethora of updates put out by 88E during the drilling of the well it can be difficult to take it all in and understand what is known, what is still unknown, and what it all means. 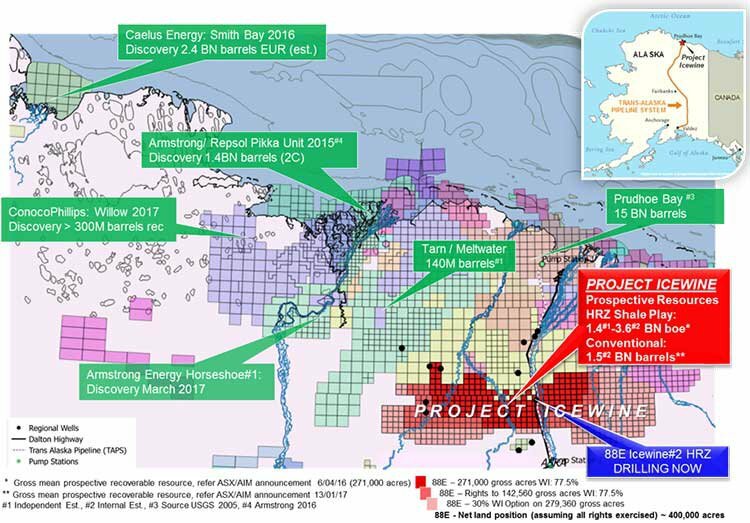 So, we’ve identified three key phases of the drilling to try and paint a picture of what 88E did, and more importantly, what it could have on its hands. Although there were some very minor delays in drilling, it went off relatively trouble-free, which is always a god-send when dealing with deep formations and tricky conditions. The first signs that 88E was onto something was at the start of December when it started to drill toward the target HRZ Shale. The first oil shows were actually above the HRZ, in the ‘Brookian’ conventional rocks. 88E hit both oil and gas shows along the way, particularly in a 110-foot section . In this section, the gas there was “significantly above background” and contained a bunch of condensate and light oil, meaning that 88E was getting closer to the source rocks. These “heavy” gas shows revealed that 88E’s assumptions about the ‘thermal maturity model’ were correct – this essentially means that there was liquids rich gas where the company thought it would be. Combine that with ‘residual’ oil shows in the section, and it proves up the presence of a working petroleum system – which we already know given that the North Slope of Alaska is one of the oiliest places on the planet. Later, petrophysical analysis carried out would indicate that conventional zones between 4000m and 4400m was made up of sandstone sequences peaking at 28% porosity. That’s a great sign on the potential of the conventional horizons 88E has tapped so far. A short while later, 88E started to drill into the HRZ target shale encountering more oil shows along the way. The oil shows were mostly encountered in the transition area between the Brookian to the HRZ, further backing up the previous drilling done in the area. There is something clearly going on in the area just above the HRZ. For now, 88E has taken a 90 foot core and sent that off to the lab to see just how strong the oil shows were. Meanwhile, it was drilling into the HRZ and while there were no immediate gas or oil shows, there was visible bleed-out gas from cuttings taken from the HRZ. While it was in the HRZ, 88E managed to successfully cut core from the shale for further analysis, with a 96% recovery factor. Promisingly, oil shows “with cut and fluorescence” were returned to the surface along with cuttings from the core. That’s a great sign, right? Well, it cut up the core into 3-foot sections for further testing, but for some reason there was no oil cut or fluorescence observed while it was doing that. However 88E believes it encountered a vapour phase (where gas meets oil! ), so that would explain why shows were subtle and may have been missed. Meanwhile, later testing of the core found liquid hydrocarbons – conclusively proving that the HRZ contains condensate and oil, and 88E is now figuring out the exact gas/liquids ratio present. What else did we learn, and what’s next? 88E has ticked the boxes to the point where the next major step is to drill a second well, and really get a feel of how 88E may be able to extract the black stuff. But remember, it’s still early days here, and 88E is still a relatively small company, and a speculative stock. It’s always recommended that investors seek professional advice if looking to invest. 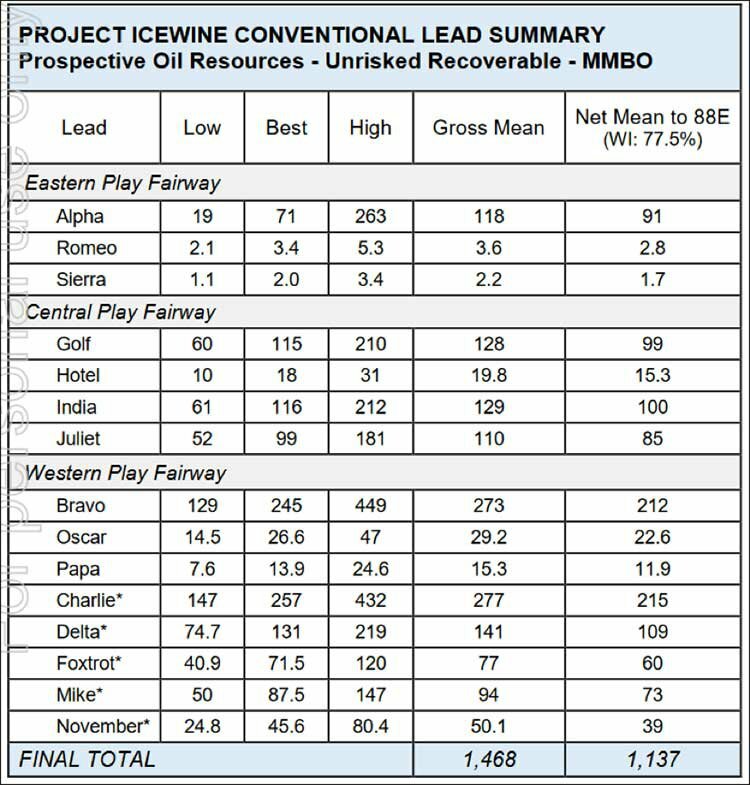 Promisingly, 88E’s Project Icewine’s early look on fraccability is like the very lucrative Haynesville and Marcellus shales in the US. Some industry experts believe the Haynesville shale could ultimately produce as much as 30 to 40 trillion cubic feet of natural gas – if 88E can identify a resource of a similar size, this could truly be a game changer. And of course, 88E is chasing the more valuable oily liquids – not gas! Remember, this is the main game for 88E (but not the only one). This is the horizon 88E thinks may hold as much as 2 billion barrels of oil (post deal to triple its acreage). The analysis so far has been very promising, coming in on the higher end of the company’s expectations . In particular, the data gathered on permeability and porosity were “significantly in excess” of cut-off limits required to make the HRZ shale play worth pursuing. Both measures were tested by crushing the core samples to fine grains to ensure a more accurate reading could be taken. Out of 18 samples, 16 came back on the high side for permeability, and two came back at levels simply too high for conventional testing . It didn’t spell out a porosity figure, but said it came in “at the upper end of expectations as per prognosis.” And remember, we know the porosity down the road was excellent from the Great Bear results. These were two key measures, and do go some way towards de-risking the HRZ play. Meanwhile, during drilling 88E was able to confirm that there was liquids in the core , which is a great sign. At the end of 2015, 88E’s early analysis did suggest the HRZ at Icewine-1 was within the thermal maturity hotspot that the company thought it was. Oil shows were recorded, with cut and fluorescence seen in cuttings which came up to the surface. However, as we outlined before, these weren’t recorded when core was cut into 3ft sections. Despite this there was an increase in condensate rich gas while 88E was drilling though the HRZ. The positive news is that during initial leaching of the core , liquid hydrocarbons were proven . The fact they weren’t seen while the core was being cut simply means that they were hiding within the shale. Meanwhile, mass spectrometry analysis has confirmed the presence of liquids-rich gas throughout the HRZ interval. The early core analysis also found that the HRZ has total organic content of around 3.5%, which is better than many other commercially successful shale plays in the lower 48. Its also worth mentioning that during the drilling of Icewine #1, 88E also took core from the underlying Pebble Shale, which should help them determine whether it acts as a bottom seal for the HRZ. 88E also plan to be acquiring seismic in the nearer term, which means it will get more information on the geology of the area. But as far as unconventional oil and gas exploration goes – so far, so good. Finding liquid hydrocarbons within the core is a huge first step, and while on its own it isn’t enough to call it a success or a failure, it’s just about a good a start as you can get – especially when taking into account the technical work on porosity and permeability. The liquid in the core would also explain the very promising thermal maturity numbers it recently received. In a nutshell, testing of the core for thermal maturity has confirmed that the shale at Icewine-1 at least is within a volatile oil and wet gas window . This means a higher oil than gas ratio present, while the oil which is there is likely to be of a low viscosity instead of the sticky black stuff which can be tough to get out of the ground. Given that the shale core was found to have the characteristics of a sweetspot, and that same shale is present across a fair chunk of its acreage, 88E will now work the data into an updated independent resources report. We can’t wait to see that. On the conventional side, the Brookian sequence (which goes down to the HRZ) intersected what seems excellent reservoir properties with hydrocarbon shows throughout the section. It’s in this section that it hit oil and gas shows in a 110-foot section. Below the HRZ Shale, it hit what is called the ‘Kuparuk Sands’ interval, recording elevated gas readings over a 58-foot interval , with a petrophysical analysis of this interval underway. Preliminary analysis, however, indicated porosity of up to 15% and good permeability. 88E called that porosity figure “substantially higher than anticipated”. There’s little information available right now, and all sorts of data needs to be interpreted before making a call on whether or not the conventional could be considered for development – but the signs appear good. One of the key doubts on the deeper conventional horizons before the drilling was the porosity and permeability of these layers, and these now appear to be in 88E’s favour. Again though, over the next few months it will be releasing more information as it gets the results back from the lab. Interestingly, 88E’s Managing Director Dave Wall confirmed, at the same time 88E told the market about liquid hydrocarbons in the HRZ shale, that one of the main aims of the impending seismic campaign would be to identify any large conventional prospects at Icewine. “Given the intersection of high-quality reservoir in Icewine-1 boosted our view of the conventional potential at Project Icewine, we are concurrently progressing our seismic program with the aim of complementing the HRZ shale play by quantifying the conventional prospectivity at Project Icewine,” he said. With the lab results in hand, 88E will have a few decisions to make on where to go next. The first thing it needs to do is get numbers back on rock mechanics from the HRZ core samples. Rock mechanics will tell 88E how the rock may respond to fraccing. After all, you can have all the porosity and permeability you want, but if you can’t frac the rock then you’re probably not in for a good time. In the near-term as well, it will make a decision on acquiring more seismic. Once it‘s acquired seismic and is able to marry up this data with that the data from the cores, it will have a clearer picture of what the future could hold. The next key decision will be about how to drill Icewine-2. Should 88E elect to drill a follow-up within the next 12 months, it will need to attract a partner to take over the heavy lifting on the funding front. Without wanting to pre-empt anything however, results from both the conventional and unconventional are looking promising at this very early stage. While it was drilling away at Icewine-1, 88E tore up the playbook and decided to give the Alaskan oil and gas scene one heck of a shakedown. It made the decision to effectively triple its acreage position at Icewine for a down payment of $740,000, or 20% of the total sum to secure the acreage. Together with its joint venture partner Burgundy Xploration, it was announced the winners of a state of Alaska bidding process for the 174,240 acres sitting next to its current Icewine acreage. That means that the JV now has 272,242 acres under its belt. Here’s something – if Icewine were a country, it would be the 171 st largest country on earth by land mass thanks to the deal. 88E is so confident that the Icewine drilling will prove up a horizon across the entirety of Icewine that it decided to do the deal while it was still drilling . If that doesn’t scream moxie, we don’t know what does. What that deal also did is effectively bump up its pre-drill estimates of just how much oil could potentially be on 88E’s hands. Before the drilling, independent assessors DeGolyer and MacNaughton came up with an assessment of just how much oil could be under the tundra at Icewine. Again, this was before drilling – so based off pretty limited information. Again, this gives you some idea of the scale 88E is chasing with its acreage position. Scale, especially in a low-price oil environment becomes very important when trying to lure a major to the party. Part of the reason 88E and Great Bear/ Otto Energy have been able to poke around near Icewine is that traditionally, the supermajors in Alaska have been focused on oil projects in more proven basins to the north. As you can see from this simplified map from a previous explorer in the region, the likes of ConocoPhillips, Repsol, ExxonMobil, BP, and Eni are all producing from Prudhoe Bay and Kuparuk River. For pretty good reason, too. Those regions are proven oil producers, where majors can simply plop down wells and watch the oil flow. In the case of 88E, it’s poking around unproven acreage hoping to prove up a potentially massive shale play. 88E is now attempting to lure the interest of a mid-weight or major producer in the region by building scale. 88E Managing Director Dave Wall said at the time of the land acquisition recently that the company does not want to prove up a play and then have someone else acquire a large portion of it. Wall went on to say that despite not having definitive data, if the HRZ play were to be successful then the option value associated with the success case versus the relatively small down payment required was an opportunity than could not be passed up. “Any success at Icewine-1 will result in substantial industry interest, which we hope will lead to a highly accretive farm-out in 2016,” Wall said. What 88E is doing here is building scale, and building the kind of proposition which may lure the big boys. Majors generally have way too much on their plate to take punts on small ventures, so they need the sort of scale play 88E is building in order to have a nibble. The low-cost oil environment also leads to the possibility that majors will be looking for counter-cyclical plays, building their positions and snapping up all they can so they can make the maximum amount of money should the oil price rebound. Even if it doesn’t, to make money out of oil you need scale. In fact, at $30/bbl you need three times as much oil as when it was $90/bbl to make the same amount of money. So in both scenarios, scale is the key . The drilling at Icewine-1 has brought up some promising results, but over the coming months we’ll start to get a true picture of just what Icewine could look like from a development viewpoint. The next few months could cement the HRZ as one of the more promising plays in North American oil exploration. But it’s not a guarantee. This is still oil exploration and there are risks involved. 88E is a speculative stock and caution is advised. 88E has put together funding thanks to a facility from the Bank of America, it’s put together a great team on the ground in Alaska and the sales strategy for potentially luring a supermajor or National Oil Company (NOC). Now it’s just a matter of time to see whether the rocks want to play along. There were oil and gas shows in several zones while drilling, so the initial signs are positive. However, it’s impossible to tell for sure until the cores from the well and petrophysical data is analysed further and, of course, the next well is the real test. Should the lab results come back positive, it could just be the first step on a very, very exciting journey for 88E. One where the size of the prize continues to attract investors and interested parties who can help to substantially re-rate the company. 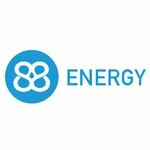 88E will be one to watch over the next few months and we here at The Next Oil Rush look forward to following the story. 88E Bolsters Multi Billion Barrel Oil Resource: Farm Out by Year End? Is 88E About to Deliver a Game Changing Farm Out? Can 88E Unlock the World’s Next Multi-Billion Barrel Oil Play?